An essential shower aid for those who have difficulty standing for extended periods or balance issues. The extra-wide seat is equipped with handles to make the process of standing and sitting as easy as possible. The base of the item will fit most bath tubs and showers measuring 23.3" wide and is equipped with rubber tipped caps to avoid slipping during use. Feel comfortable and secure when showering. Ergonomically designed, the extra wide seat supports up to 300 pounds. Padded handles on each side provide a comfortable grip without the risk of slipping. Each chair leg is capped with a rubber non-slip, anti-skid tip for additional safety and security. Easily assemble the lightweight shower seat without the use of any tools. Tool-free removal of legs, armrests, and backrest make storage and travel easy and convenient. Contoured for superior comfort, the nonslip seat and backrest are constructed with a lightly textured composite material. Drainage holes reduce slipping or sliding on pooled water, creating a safe and comfortable shower seat. 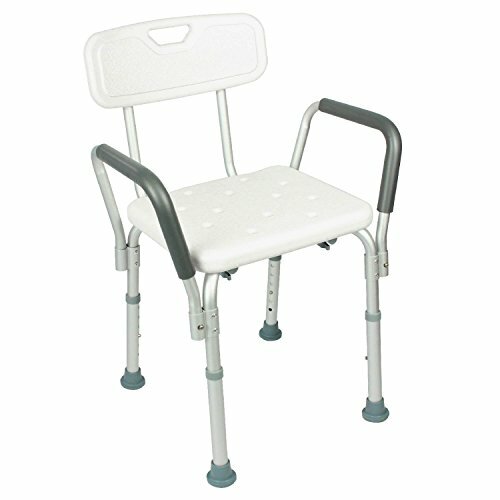 Corrosion resistant aluminum construction is the perfect choice for a lightweight bath chair or shower bench that will not rust. Easily adjust the height of the shower chair seat to create a secure, customized experience. With a range of 14"-19.5", the seat adjusts to fit any height, or to provide additional stability on uneven flooring. The backrest is also removable if desired. Unconditional lifetime guarantee so you can purchase now with confidence. SHOWER SAFELY: Feel comfortable and secure when showering. Ergonomically designed, the extra wide seat supports up to 300 pounds. Padded handles on each side provide a comfortable grip without the risk of slipping. Each chair leg is capped with a rubber non-slip, anti-skid tip for additional safety and security. EASY TOOL FREE ASSEMBLY: Easily assemble the lightweight shower seat without the use of any tools. Tool-free removal of legs, armrests, and backrest make storage and travel easy and convenient. COMFORTABLE NON SLIP SEAT WITH DRAINAGE: Contoured for superior comfort, the nonslip seat and backrest are constructed with a lightly textured composite material. Drainage holes reduce slipping or sliding on pooled water, creating a safe and comfortable shower seat. DURABLE AND VERSATILE: Corrosion resistant aluminum construction is the perfect choice for a lightweight bath chair or shower bench that will not rust. Easily adjust the height of the shower chair seat to create a secure, customized experience. With a range of 14"-19.5", the seat adjusts to fit any height, or to provide additional stability on uneven flooring. The backrest is also removable if desired.